I dream of mornings like this when the earth holds its breath and beauty shines forth free of inhibition. Fleeting moments like this come around only once every five to ten years and on this morning I was fortunate enough to be there to experience it. These are the moments we long to hold on to, when something beyond the physical breaks through and speaks to the depths within us. 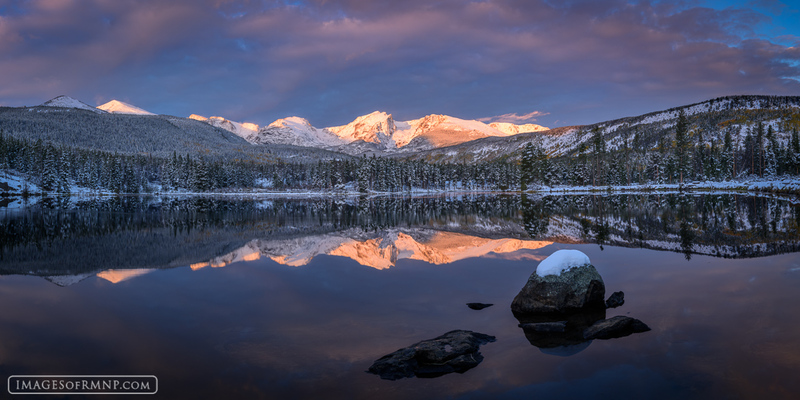 On this autumn morning the Continental Divide covered in a fresh coat of snow reflects in the perfectly still waters of Sprague Lake. Photo © copyright by Erik Stensland.